Pakistan 7-329 (Ahmed Shehzad 103, Fawad Alam 74, Shahid Afridi 59, Mominul Haque 2-37) beat Bangladesh 3-326 (Anamul Haque 100, Imrul Kayes 59, Saeed Ajmal 2-61) by three wickets. The Bengal Tigers scored 326 runs for the loss of three mere wickets and the Green Shirts achieved the target by hammering 329 runs with three wickets in hand and one ball to spare. 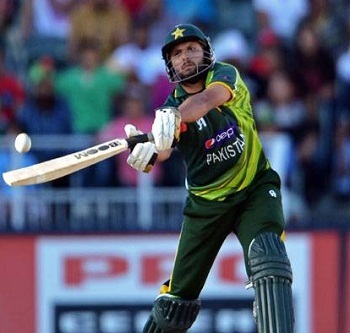 Shahid Afridi (Pakistan) was declared ‘Player of the match’ for his sizzling batting in the game. The 8th match of the Asia Cup was played on Tuesday, March 4, 2014, at Shere Bangla National Stadium, Mirpur. Earlier, Mushfiqur Rahim won the toss for the hosts and opted to bat first on a batting track. Anamul Haque along with Imrul Kayes gave them a rising beginning by scoring 71 runs in 15 overs. The first went past his fifty in the next over and the latter completed his 10th ODI half century during the 24th one. The tremendous partnership was broken at 150 when Imrul Kayes was gone for 59. Mominul Haque dropped in next while Anamul Haque smashed his second ODI hundred and was gone for 100 off 132 balls with 4 big sixes and 6 fours. Mushfiqur Rahim got in next and kept the run rate alive with frequent hitting. Mominul Haque reached his third ODI fifty and was dismissed at 249 for 51. Shakib Al Hasan appeared in the park next and Mushfiqur Rahim crossed his 14th ODI half century. They remained unbeaten for 44 and 51 as the hosts piled up 3-326 after 50 overs. Saeed Ajmal was the most successful bowler with two wickets and Mohammad Talha held one. Ahmed Shehzad along with Mohammad Hafeez started off slowly but kept on cruising with determination. The latter attained his 20th ODI, he was dismissed at 97 for 52 and the incoming two batsmen surrendered within eight runs. The Green Shirts were reeling at 3-105 when Fawad Alam joined in with Ahmed Shehzad. They kept the score board moving with odd boundaries and the latter registered his half century in the process. Ahmed Shehzad changed his gears and thrashed his fifth ODI century and became the next victim for 103 off 123 comprising 1 six and 12 fours. The next wicket fell at 225 when the Green Shirts still required 102 runs from just 52 deliveries. Shahid Afridi came in next and started off from where he left in the previous match against India. The sixes were showering from his willow in all corners of the park and he dispatched his fifty in style on the 18th ball including 6 towering sixes and 2 fours. He was run out for 59 and was replaced by Umar Akmal whereas Fawad Alam got his fifth ODI half century. The latter was finally dismissed for 74 and Umar Akmal hit the winning boundary on the fifth ball of the final over. The men in Green amassed 329 runs after losing seven wickets in 49.5 overs. Mominul Haque was the top wicket taker with two whereas Shakib Al Hasan, Abdur Razzak and Mahmudullah shared one wicket each. Pakistan triumphed in an exciting run chase with a margin of three wickets and qualified for the final with 13 points.